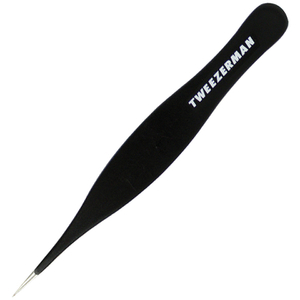 Remove and relieve ingrown hairs and splinters with the Tweezerman G.E.A.R. Ingrown Hair / Splintertweeze. Crafted from stainless steel, the innovative tweezers have been hand-filed to meticulous sharpness with tapered, precision tips that expertly remove anything embedded underneath the skin, such as splinters and ingrown hairs. With near surgical accuracy, the tweezers are recognised worldwide for their design innovation. - K.N. To ease tweezing, take a hot shower or use a warm washcloth to open pores. Tweeze in the direction of hair growth to avoid breakage. To close pores post tweezing, use cold water or astringent.